After their kaleidoscopic HELL, Emio Greco and Pieter C. Scholten continue their journey through Dante’s La Divina Commedia with a [purgatorio] diptych. In [purgatorio] POPOPERA, Bang on a Can composer Michael Gordon enriches the typical Emio Greco | Pieter C. Scholten research on the relationship between dance and music using structural elements from rock music. Six dancers intertwine with gleaming black electric guitars. A cross? A third arm? A lump of suffering? Dancers mutate into instruments. Raging guitars become fragile flesh and blood sound-boards. Chained by strings a crowd of dancers seeks purification in a redeeming rhapsody. [purgatorio] POPOPERA blends raw unpolished musicality with fine physical virtuosity and dissolves the borders of music and dance. Pretext. Image. Scent. Text. And context. A synergy of various artistic energies clustered around the theme of purgatory. 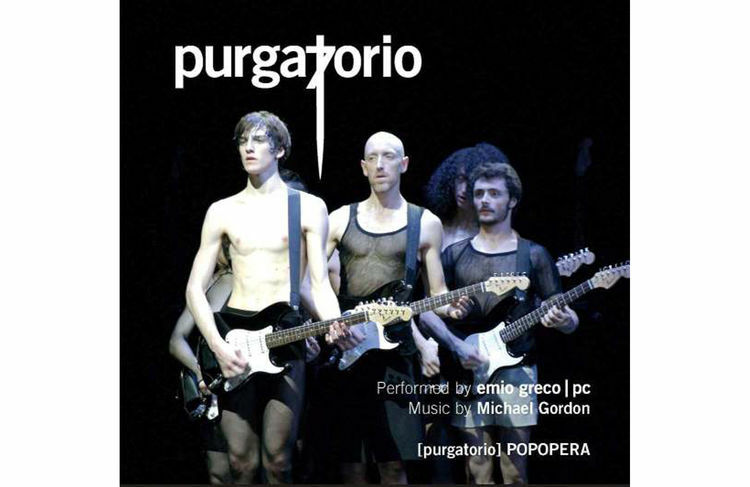 That is what the [purgatorio] magazine, closely linked with the EG | PC performances [purgatorio] POPOPERA and [purgatorio] IN VISIONE, has to offer. The work of the choreographers and the artistic team feeds the essence of the magazine. In its turn, the magazine perfumes the creation process as an interactive forum. A purifying reciprocity.